Let it be known that I’m an avid, happy camper and I love the outdoors. With that said, I’ve also met a lot of people who would love to try camping but don’t know where to start. It’s perfectly understandable that they wouldn’t want to go out and try something new without preparing for it, so I decided to write a short article that will provide some essential information for camping beginners, and send them on their way to experiencing and enjoying the joys of camping and the outdoors. If you’re just starting out camping, I would suggest visiting one of the plentiful public campgrounds that you can find in national and state parks. Always pick the one that’s nearest to your home if possible. These public campgrounds are usually run by government agencies like the Bureau of Land Management, the Army Corps of Engineers, etc. They are typically found along scenic spots and on vast lands that are set aside for preserving the natural environment, and for people who want to enjoy the outdoors. Where to find them? Going online is the best way to do so. Websites like Park Net and Reserve USA offer a vast database of information about ideal and available camping spots. 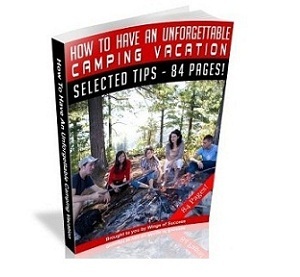 Now that you’ve found your perfect campground, there’s more to learn. First, always stop by the campground office and check in when you arrive. Introduce yourselves and provide some necessary information, like the number of campers with you, how long you’re planning on staying, and whether you’re in a tent or an RV. You can also ask if you can take a drive through the area to find a suitable campsite. If the office has a map of the campground, you can use it to check the locations of important spots. Inform the attendants if you’d like a campsite close to the lake, or about any other preferred locations you might have. It’s not guaranteed that they can always accommodate you, but telling them about it as early as possible will let them make the necessary arrangements and increase the odds of you getting the location you want. You might also want to inquire about the camp rules and regulations during this time, and any other questions that you might have. You should also know what to look for when picking out your campsite. Ideally, choose a site where you can set up your tent on relatively high ground. This way, water will flow away from your tent when it’s raining, so your tent and everything else inside will remain dry. But avoid setting up your tent on a slope, either. Pick a site where the ground is high and level. You may also want to have some shade during the hotter parts of the day, so if you can, pick a spot near some trees. The only time when this is inadvisable, though, is when the weather shows likely signs of raining. Then you’d be risking the chance of becoming a target for lightning strikes. Other things to check for are water sources and cooking areas. You will need lots of water for cooking, washing, and drinking, so make sure you camp near a water source. Check out the locations of the cleaning stations, as well. Never use bathrooms or drinking fountains for washing dishes. Make sure also that your campsite has a grill and a picnic table with benches. A flat, wide area without any leaves or twigs nearby is also ideal for campfires and using stoves. Another important thing, especially if you have kids, is the location of any playgrounds or play areas. You might want to be near playgrounds, so that the kids won’t have to walk far and you can easily keep an eye on them, but if it’s peak season, the playgrounds will be sure to have lots of other children playing as well, so you might want to stay away from them to avoid the noise. It all depends on what your preferences are. You also need to look for locations where you can play ball games, or if you’re near a lake, go fishing, swimming, or boating. Experience will teach you a lot more than I could in this article, so the best advice I can give you, aside from the things I told you here, is to go out and start camping. Enjoy life outdoors!